Developed by Mohawk Games. Published by Stardock Entertainment. Available on PC. Released April 28, 2016. Review code provided by publisher. 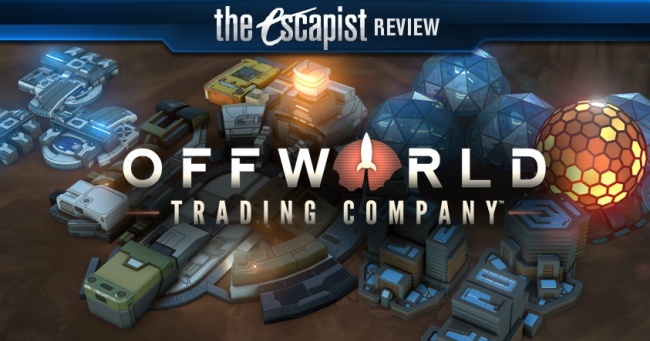 Offworld Trading Company wasn't something that immediately jumped out at me as a must play, but the more I heard about it, the more it intrigued me, and I finally sat down with it to check it out. 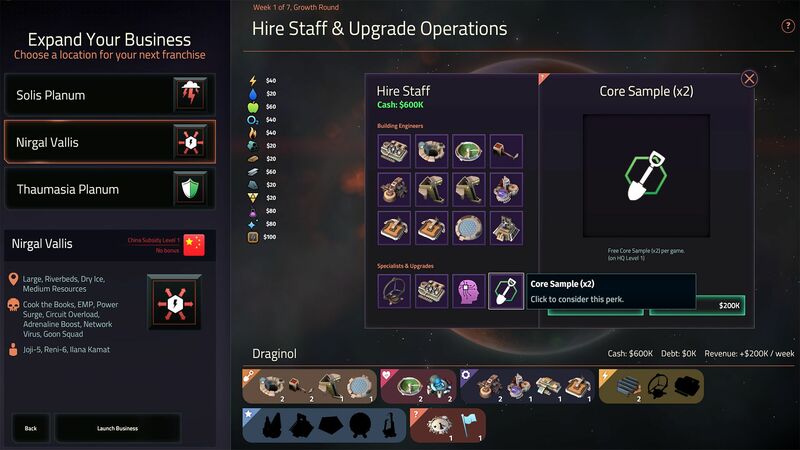 It wasn't anything like I had expected, and puts a unique twist on the strategy genre with your in-game power being directly correlated to your business and investment prowess. If you're scared of math or just hate spreadsheets, steer clear, as OTC is predicated on a quick eye for trending resource prices and on-the-fly cost-benefit analysis. It's not so complex that it stops being fun, but it's involved enough that those with an innate distaste for numbers games should steer clear. Every game of OTC starts with fundamentally similar and likely familiar base building. The hitch is that there are a lot of different types of resources that you have to choose from, and resources are all you'll ever have to fight with. Every game plays out differently, as different forces sway the market in different directions. One game, you may strike it rich with a stockpile of O2, while another game the O2 price plummets, but your silicon stores keep you afloat. Long-term goals usually include producing Glass, Chemicals, or Electronics, which seem to be the most reliably sound investment for on-the-spot trading. The titular offworld trading usually comes into play late game as well, and acts as a direct "buy low, sell high" tool for offloading resource stockpiles or just earning some quick cash. You can turn a profit even if you don't have the resources yourself, assuming it's cheap enough on Mars and expensive enough offworld. Depending on modes, you'll sometimes need to buy out your opponents' companies - just a friendly little hostile takeover of a rival corporations - while other modes will have you racing to invest the most into a new colony. In either case, you need to make more money than your opponents, and you have to do it faster than them. If you're too slow to raise capital, you'll get bought out, or just won't be able to compete with rival investments. A good start is critical, but the dynamic game systems give you ways out when you need them. When you realize you've invested heavily in a resource that keeps losing value as your stockpiles grow, you'll need to shift gears quickly to get caught back up. You can scrap your buildings to free up "plots" which are how you'll expand your operation. Each building takes up a tile - a "plot" - of which you have very limited quantities. Starting off with only a handful forces decisions on where your early focus will be, but the ability to scrap buildings to reallocate plots to another resource is key to avoiding amassing worthless commodities. If everybody starts off focused on Silicon collection, for example, the surplus on the market will drive values down for everybody. It's important to keep an eye on what your opponents are doing to avoid too much direct competition for market space. 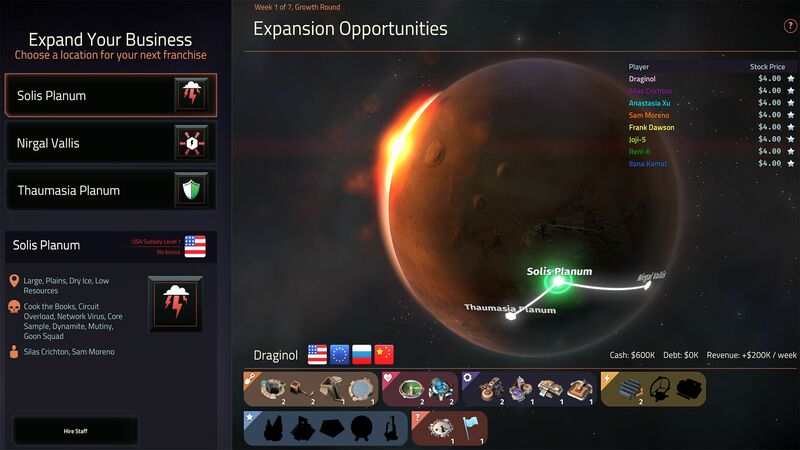 The real-time, market trading, economy simulation aspect of OTC is where the fun of the gameplay lies, of course, but the details of the game's representation of the Red Planet itself is founded on legitimate scientific research. In fact, Mohawk had a planetary geologist, Dr. Kirby Runyon, as a science consultant on the game. There's an interview with Runyon (conducted by Stardock, not The Escapist) at the bottom here with a lot of specifics about the science behind the game. Commitment to realism doesn't always improve games, but in cases like this, it adds a lot to the immersion. 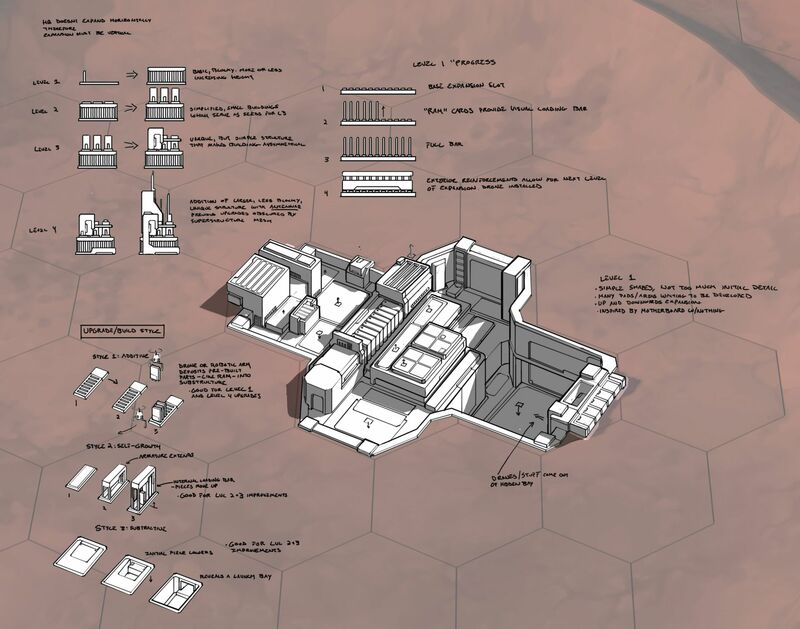 It may be a while off yet, but we're not as far from mining on Mars as you might think. The use of legitimate planetary science in OTC reminds me of the real-science foundation for The Martian, and there are even parallels between the needs there and the resource economy in OTC. Where Matt Damon burned hydrogen to create water, OTC does the reverse, converting water stores to O2 and Hydrogen(fuel). You can farm the ice at the pole for water and carbon (CO2, as explained in the interview below, is the cause of the "swiss cheese" formations). While all this usually leads to top-tier resource creations, Electronics, Glass, or Chemicals, sometimes the components are scarce enough to be more valuable than the products, so you have to be flexible in your plan, or you'll lose a ton of efficiency. 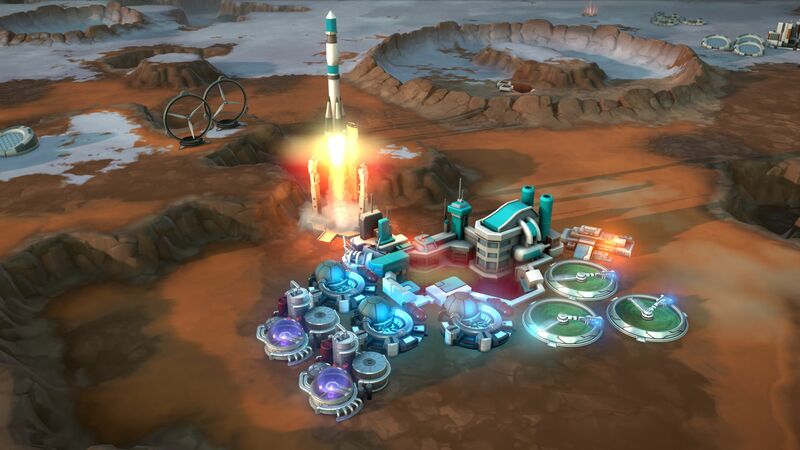 Offworld Trading Company takes the core strategic elements of resource management and base building, and slaps it onto a sort of supply-demand market simulator. The Black Market - expensive, but effective means to sabotage your opponents, or bribe your way to profitability - adds the uncertainty of the human element, but the rest is all about being a more effective planner than your corporate rivals. Bottom Line: I can't imagine a game so fundamentally about number crunching being universally appealing, but the audience it will appeal to will absolutely love it. 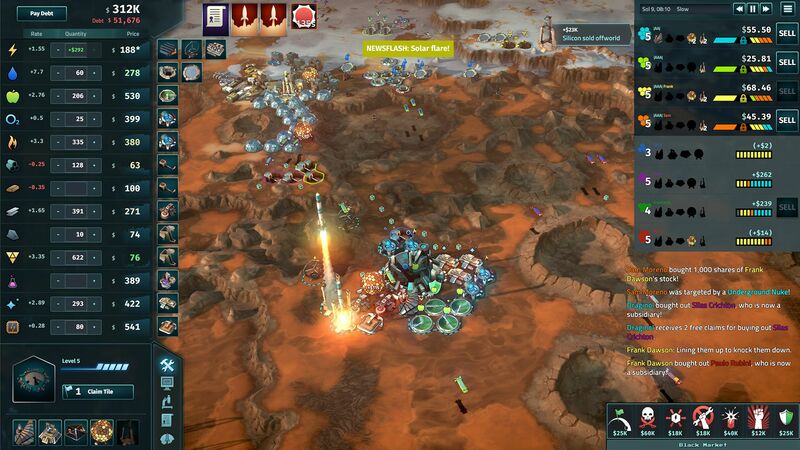 Recommendation: If you like numbers, strategy, or science you'll certainly get a kick out of Offworld Trading Company. If any of the above scare you, so will OTC. Sometimes, you just happen to be at the right place at the right time. Sometimes, the stars align (forgive the space pun) and everything falls into place just as it was meant to be. Sometimes, the universe slaps you in the face with an opportunity and cheerily exclaims, "Here you go!" This is exactly what happened to planetary geologist Kirby Runyon, the science consultant for Mohawk Studio's first game, Offworld Trading Company. "It was crazy," said Runyon, his voice practically bursting with enthusiasm. "I met Dorian at church and we happened to start talking about what I did for work. When he found out I was studying for my PhD in planetary geology and that Mars was a huge focus of mine, he said they needed someone just like me for a big project he was working on. That project was Offworld." Kirby has been interested in outer space from a very young age. Over the years, his passions fostered and grew, leading him to his final year of study for his PhD at a university in Maryland. Kirby's knowledge of planetary geology, and in particular of Mars, is indicative of his years of extensive study and research. "Mars' geology is incredible," he said. "There are some things so wild that we couldn't even put them in the game because we were afraid that people wouldn't believe that they were real, actual geologic occurrences. For example, there's something called 'swiss cheese terrain' on Mars' south polar ice caps. Carbon dioxide ice sublimates and re-accumulates repeatedly over time, overlapping each other, eventually leading to this kind of formation." 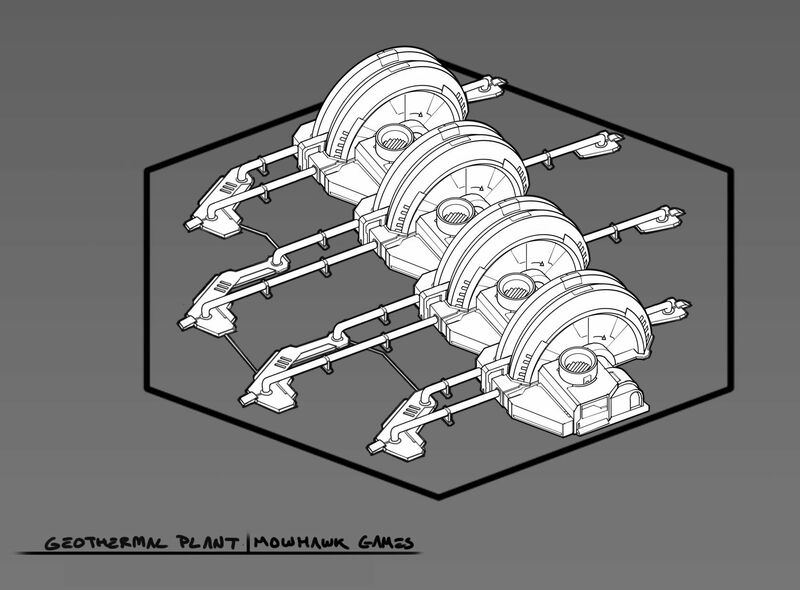 Throughout the development of Offworld Trading Company, Kirby's insight has been crucial. 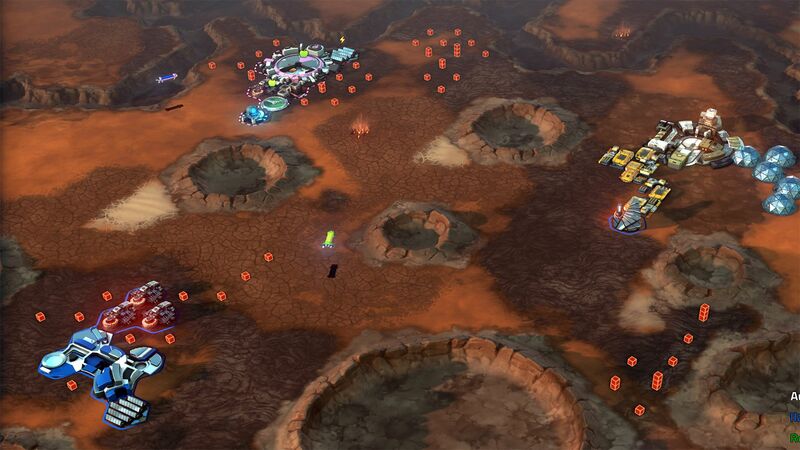 While the game offers some random generation options for maps, many of the playing fields were designed by Kirby and emulate some very specific places on Mars. "Mohawk was really dedicated to a level of scientific realism," said Runyon. "It's great that space is being shared just beyond what is strictly "scientific." It's an awesome setting for this game, and I hope that it does a lot to draw people into wanting to learn more. I'm so excited to be able to watch science infused with art." Kirby believes that carving a life for humanity on Mars is entirely possible some day. When asked what humanity's greatest challenge would be when trying to settle on Mars, the answer came easily to him. "Radiation," he said. "Radiation exposure is the biggest obstacle to overcome right out of the gate. Earth has a magnetic field to protect us from it -- Mars will give you cancer. It'd take time to develop, but possible gene therapy, biological advances, or other ways of limiting exposure can make it work for a human." "I'd say the best place to set up a colony for living would be somewhere near the equator," he said. "You'd have access to solar power, and you want as much atmosphere above you as possible, so somewhere near the southern hemisphere would be ideal. As far as landing goes, because you want as much time for those parachutes to deploy to slow down the vessel, somewhere like Argyre or Hellas would be good. Or, a favorite of mine, a really deep chasm called Valles Marineris. If I could go to live on Mars, that would be the place I'd want to see." "I love studying space and I'm so excited to see it being shared in all different sorts of media, and now in a game. I hope that people who play Offworld will enjoy it and become interested in the mysteries of space and want to learn more. Nothing would make me happier." 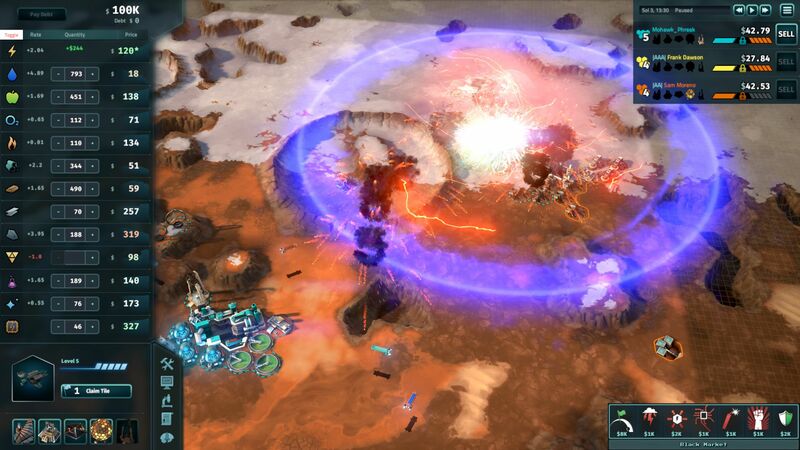 Interview by Stardock's Christine Eason.